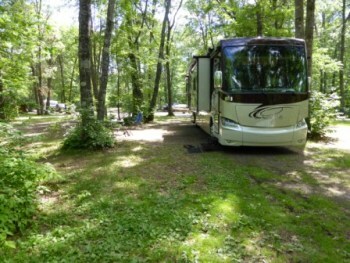 Kohler-Andrae State Park, Wisconsin has always been one of our favorite places to camp. 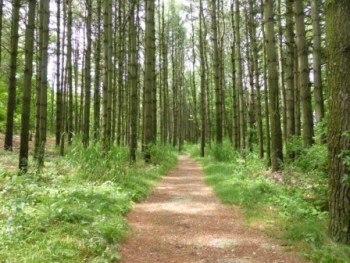 The variety of trails within a few minutes walk of our site is wonderful. 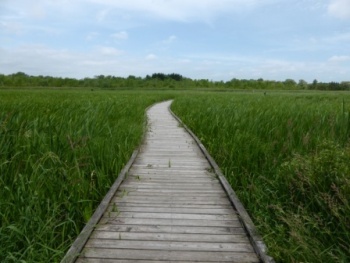 The Black River Marsh Boardwalk is right outside our window. 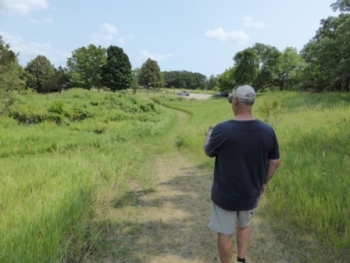 And the Woodland Nature trailhead is 50 yards away. 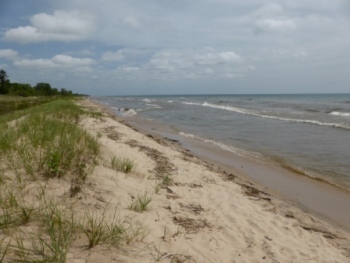 Within 10 minutes the Woodland trail becomes the Dunes trail and a deserted beach awaits on the shore of Lake Michigan. 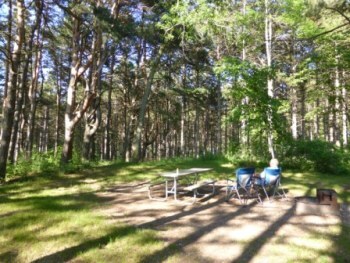 Our campsite is totally private with a fire ring and picnic table surrounded by tall pines. The Bull at Pinehurst Farms, designed by Jack Nicklaus, is ranked #77 in the USA. It's tough! 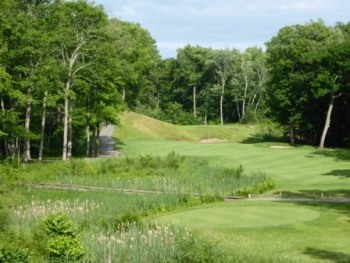 The par three (above left) was 160 yds. of all carry. Vicki hit a driver and got a birdie!! 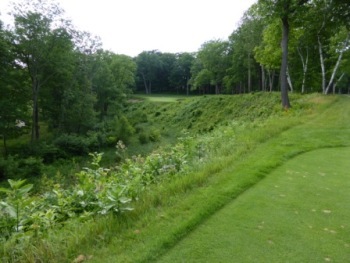 Of course, the many hazards and traps on a later par four ate her up. 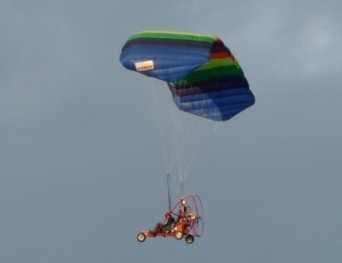 We saw this guy flying up above. The highway north to Minocqua was lined with wildflowers, white birch and red pines. The huge window in the front of the motor coach gives an expansive view that really brings in the scenery and makes travel fun. 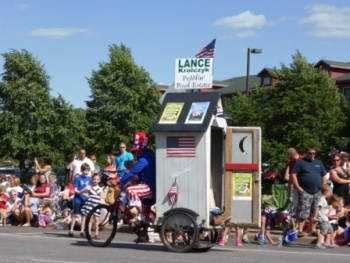 The 4th of July parade in Minocqua was real Americana - right down to the man in the outhouse throwing candy. 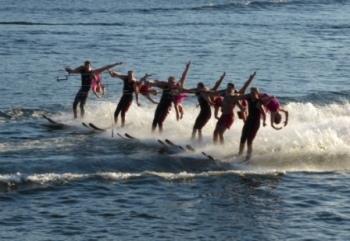 The Min-Aqua-bats performed for free every night of the week to celebrate. 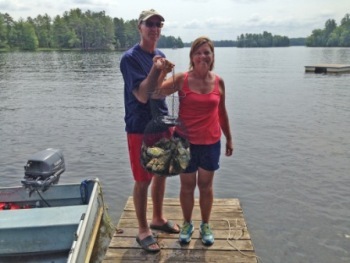 Mark & Michele show off our day's catch of 47 crappie. 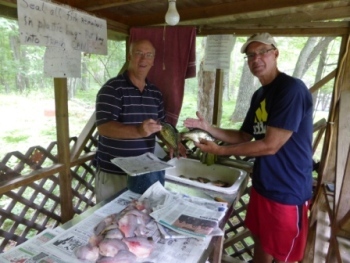 Paul & Mark cleaned them all before the fish fry that evening. Our campsite at Lake Chippewa Campgrounds near Hayward, WI was very peaceful. 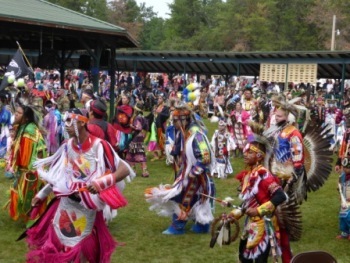 . . unlike the drumming and songs at the "Honor the Earth" festival - one of the best known Pow Wows in the USA. 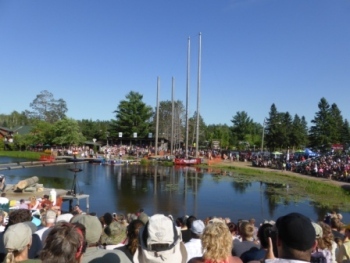 Thousands of people attended the 4 day celebration hosted by the Lac Courte Oreilles tribe. 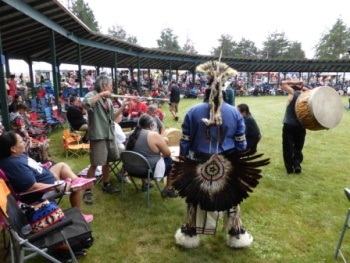 Many tribes were represented during the Grand Entry dancing, along with the fry bread, wild rice and drum contests. 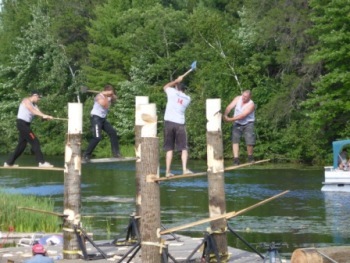 At the Lumberjack World Championships, we saw events we had never heard of before; like the Springboard Chop. These guys had to cut a wedge in the log, force in a board to stand on, chop another area to force in a second higher board and then finally stand on it to chop the top of the log off to win. They did the entire feat in less than one minute! 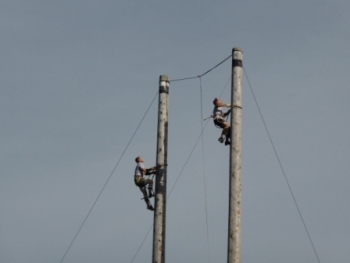 Two sets of poles stood waiting for the Pro Open Speed 60' and 90' Climbs. These guys climbed to the top and dropped back down in 12 and 18 seconds, respectively. 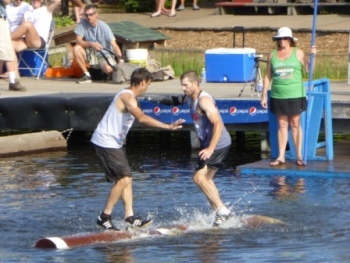 The log rolling competition was a 3 out of 5 event. JR Salzman (on the right) lost his right arm in the Iraq War, and still competed fiercely in the Pro Open category. 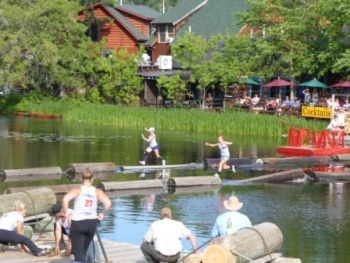 Both men and women skillfully ran and jumped back and forth across the floating logs in less than 15 seconds in the Boom Run competition. Sibley State Park, Minnesota had a lot of activities for the campers including geocaching (Paul has his GPS in hand), ranger talks at the Interpretive Center, swim beach, look out tower and buildings on the National Historic Register. 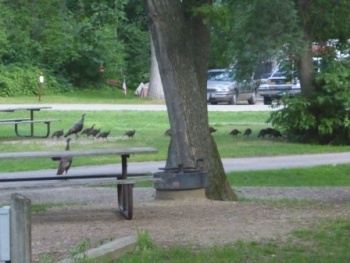 From our RV we saw a flock of wild turkeys run through the campground. 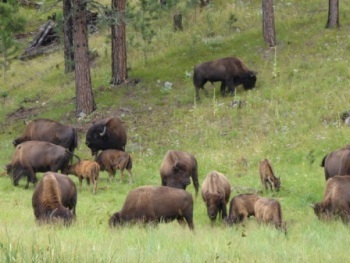 We missed a few, but counted 15 babies and 2 adults before they disappeared into the forest. 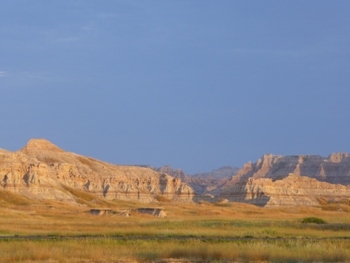 We have never had a campground all to ourselves, but we did in Forbes, North Dakota (population less than 100). 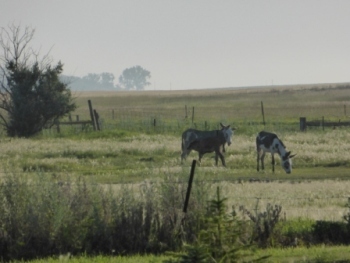 We camped with full hookups right next to a field with donkeys. We heard them hee haw every night around 11PM! 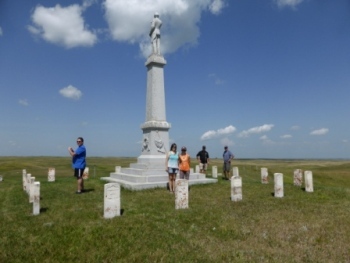 Good friends, Ross & Marilyn, together with their family took us to see the area sites; including the Whitestone Hill Battlefield where between 150-300 innocent Sioux men, women & children were massacred at their hunting camp during the Indian Wars of 1863. 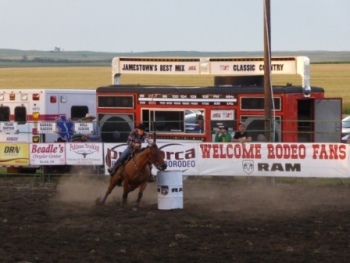 Nearby, Ashley, North Dakota hosted their annual rodeo. 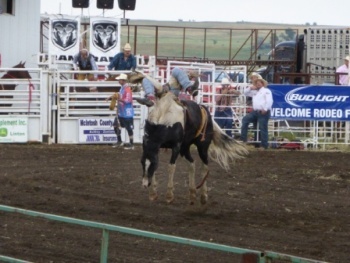 The events were really fun to watch, like the barrel racing and the bare back riding. 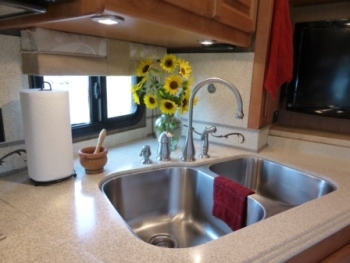 The beautiful fields of sunflowers through North and South Dakota were grown for both sunflower oil and bird seed. In some places, the ditches and roadsides were full of bloom and too tempting for Vicki to pass up. 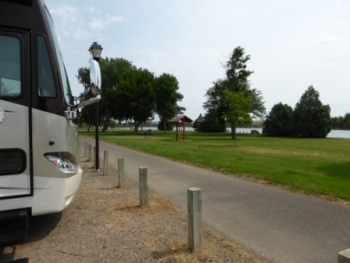 We were literally on the Lewis & Clark hiking and biking trail with the Missouri River 20 yards away from our campsite in Pierre, South Dakota. 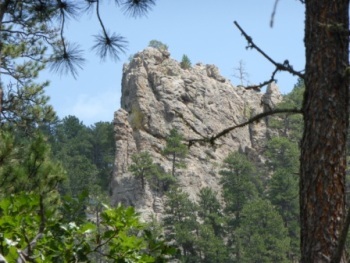 Custer State Park in western South Dakota was a refreshing change from the flat, arid prairies we saw in the eastern part of the state. 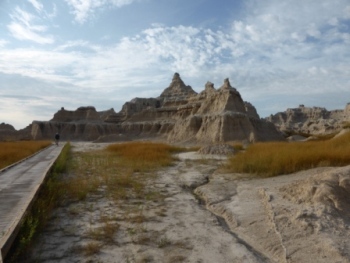 The 71,000 acre park is full of rolling prairie, forested hills and granite spires. 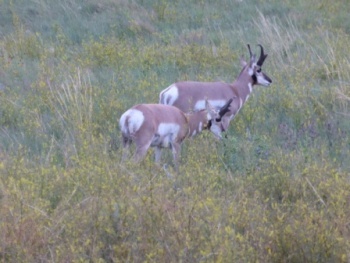 This diversity is home to pronghorn antelope (above), deer, elk, bighorn sheep and mountain goats. 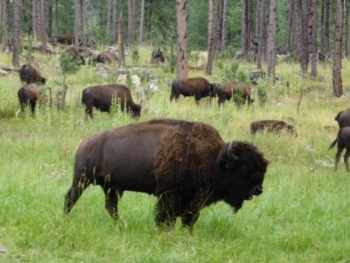 But the most famous animals here are the North American bison. 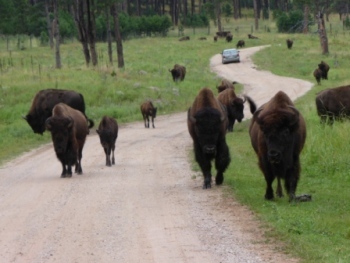 We came around the corner and almost ran into a herd of 200-300 of them. Some of the bulls looked pretty intimidating, so we sat and let them pass by us. It was fun to watch the cows and calves as they grazed right next to our car. 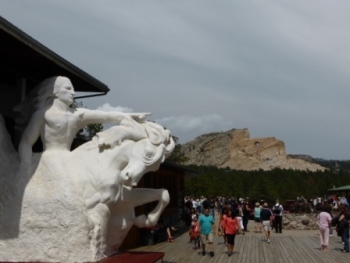 About 35 minutes away is the Crazy Horse Memorial. We were lucky to arrive in time to see them do a blast (see the smoke at the bottom) as they continue the work. The white sculpture at the Visitor's Center shows what the mountain in the background should look like upon completion when it will be the largest sculpture in the world. 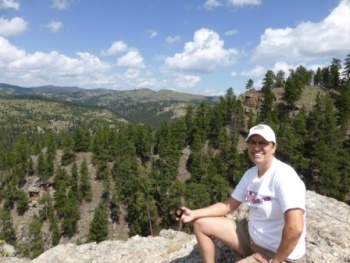 We took a 4 hour hike to the top of Lover's Leap where we had lunch with a 360° view. Mt. 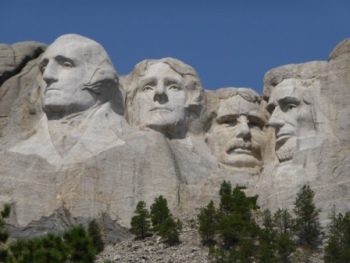 Rushmore was just like the pictures. 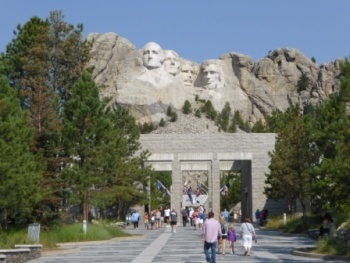 The Presidential trail below the sculpture had information boards about each president. 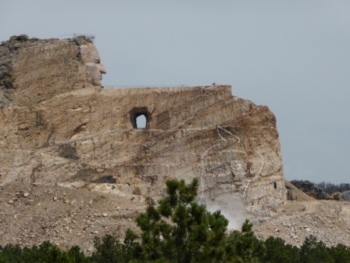 The shocking thing for us was that all 4 of the presidents' heads would fit into the head of Crazy Horse! 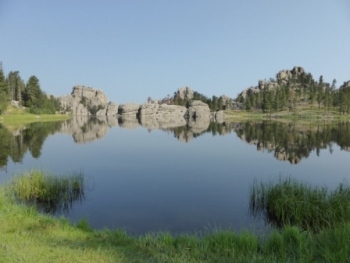 Sylvan Lake in Custer State Park was a perfect mirror for the boulders and hills that surrounded it. 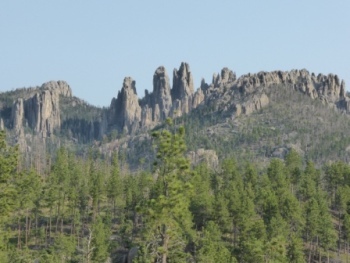 The beautiful Needles Highway features eroded limestone pinnacles along a mountain ridge that is home to big horn sheep and mountain goats. 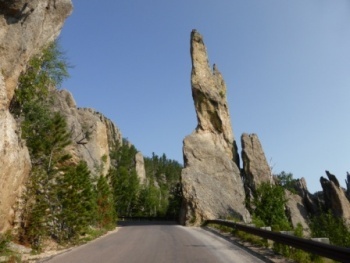 The highway winds between the pinnacles and even through them! This 8' 4" wide tunnel was barely wider than our car. 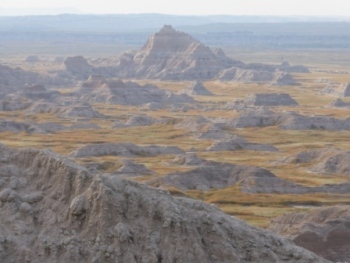 We woke up to this view in Badlands National Park, South Dakota. Wow, it is beautiful here! Since the temperature mid-day was in the 90s we took off early on the trails through the peaks. This is the magnificent view we had at the top of the valley below. 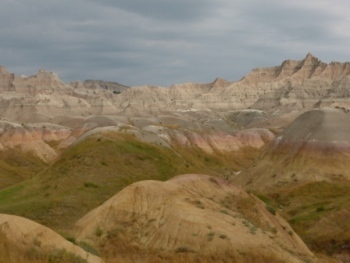 The colorful stripes in the rock were formed from millions of years of sediment. 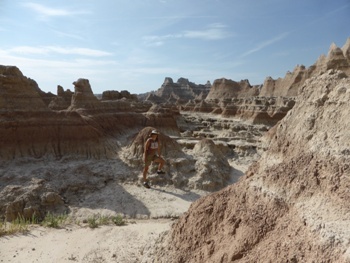 Wind and rain erosion today reveals the ages. 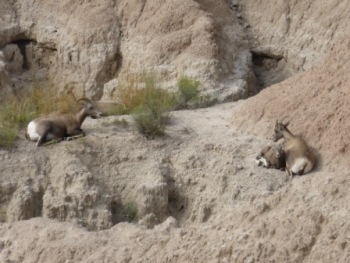 Mountain goats live in these hills. 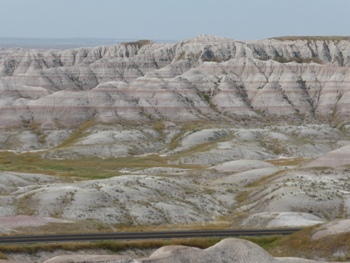 We never tired of the varied landscape. 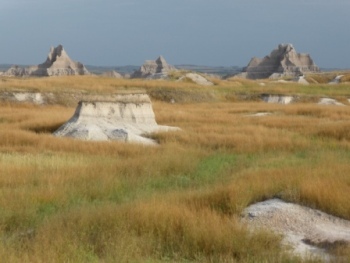 The prairie grass was dotted with tall buttes and eroded peaks. 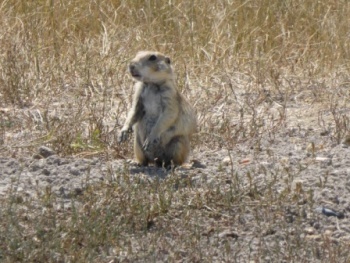 Thousands of prairie dogs live in holes they have dug here and we saw a "town" of them that stretched as far as we could see. 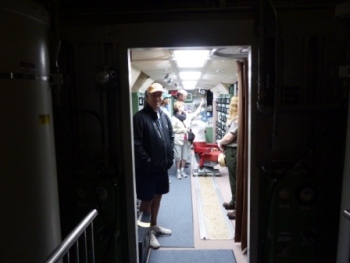 This is the Minuteman II Delta-01 Launch Control Facility located only 15 minutes from the Badlands National Park. 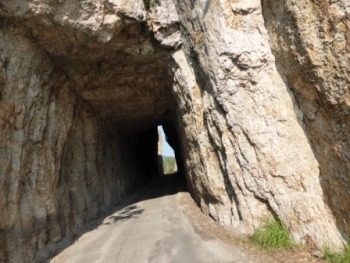 Paul said it looks identical to the one in Knob Noster, Missouri where he worked for a year. 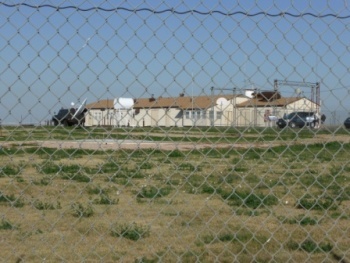 We were lucky enough to be one of the 42 people allowed to visit the site each day. Our group of 6 went underground to enter through this huge door. 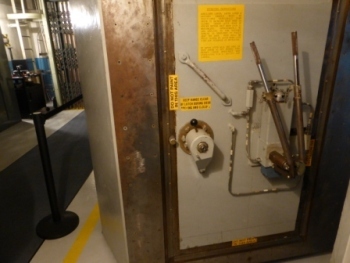 The door opened into a secure tunnel where shifts of 2 officers sat for 30 years waiting for presidential orders to launch nuclear missiles at other countries. Fortunately for all of us, those orders never came and the key to begin the launch was never turned. 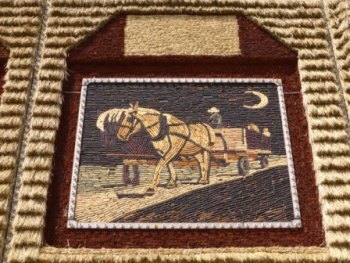 The Mitchell Corn Palace was decorated with mosaics formed with entire cobs of corn with different colored kernels. We arrived in Sioux Falls, SD just in time for their Riverfest with free bands, a balloon race, food vendors and free wine tastings! 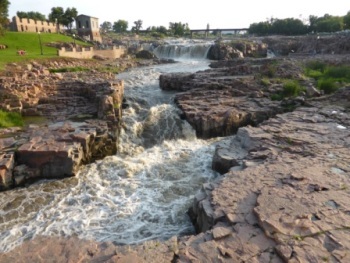 Falls Park was a great place to spend our first evening seeing the city.